It was announced today that Clay Aiken will be a featured guest star on a new one-hour episode of Phineas and Ferb. 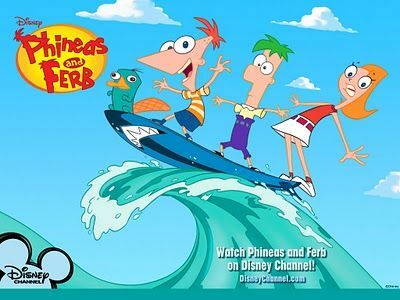 Phineas and Ferb is an animated television series on the Disney Channel. The show previewed on August 17, 2007 and is about two stepbrothers who have adventures on their summer vacation. Phineas Flynn and Ferb Fletcher live in a wacky town called Danville and are determined to pursue an active summer vacation and defeat boredom. Their sister, Candace Flynn, is obsessed with “busting” their schemes and ideas, and usually calls their mother to report the boys’ activities. Meanwhile, the boys’ pet platypus, Perry, acts as a secret agent for an all-animal organization called the “O.W.C.A.” (Organization Without a Cool Acronym), fighting Dr. Heinz Doofenshmirtz. Phineas and Ferb is known for its musical numbers, which have appeared in every episode since the first-season. The show’s creators write and record each number, and vary musical tempo depending on each song’s dramatic use. The music has gotten the series two Emmy nods for songwriting in 2008. This is another exciting performance to look forward to as Clay gets ready for a busy, entertaining summer. How fun!! It is good to see Clay partnering with Disney again!! I am sure the show will be very funny!! So, you are saying that the creators may write a musical number and Clay will sing it!?!? Cool!!! Hey, that would be great that they might write a musical number and have Clay sing it. Oh, I would just love that. Cool Beans!! Not saying for sure…but, still a great idea..and hope it comes true. That's what got my attention to Jan, he'll get to sing something written for Clay and Clay only. Cool. I've never heard of this show, but then again, I don't have young kids. I'll have to check to see when it's on here. Glad he's working with Disney again. I had not heard about this show but it sounds like a wonderful . I am excited that Clay is branching out into other areas. We already know he can do different accents, maybe a movie with Disney in the future. First we watch Sponge Bob and now this. Ha Ha I hope Clay gets to do more stuff with Disney. That could be in reality exciting. The application brought to you me personally just a few strategies and also I shall be authoring them with my web site subsequently. I’m just book-marking your site not to mention I’m going to be to return. Many thanks! Error: Error validating access token: Session has expired on Tuesday, 21-Aug-18 16:13:01 PDT. The current time is Wednesday, 24-Apr-19 21:25:36 PDT.